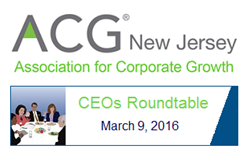 SBS Group is sponsoring the Association for Corporate Growth (ACG) New Jersey’s “CEOs Roundtable” on March 9, 2016. The event will take place at Ristorante de Benito in Union Township from 5:30 – 8:30 PM. The Association for Corporate Growth was founded in 1954 and is a global organization with over 58 chapters and over 14,000 members. The goal of the organization is to bring like-minded business leaders together to help them achieve their business and professional goals. ACG New Jersey boasts members from small entrepreneurial companies to large influential corporations. ACG New Jersey holds several meetings and events every year to gather its members to discuss business trends, problems and solutions. To learn more about ACG New Jersey, please visit their website http://www.acg.org/newjersey/. SBS Group is a national Microsoft master VAR (Value Added Reseller) with Gold level competency in enterprise resource planning (ERP) and customer relationship management (CRM). Over the past 25 years, they have been recognized as Microsoft Partner of the Year, Inner Circle Member and Microsoft President's Club member multiple times. The company is headquartered in Edison, New Jersey and operates offices across North America. For more information, please visit SBS Group's website at http://www.sbsgroupusa.com. Follow us on LinkedIn at http://www.linkedin.com/company/sbs-group, on Twitter at http://www.twitter.com/sbsgroup and find us on Facebook at http://www.facebook.com/SBSGroupUSA.